Welcome to Trampoline Review Guide! Our site provides comprehensive reviews to help you find the best trampolines and F for you and your family. We review all of the latest trampoline brands including Springfree, Skywalker, and many others. And we take pride in providing you with honest, unbiased, and easy-to-read trampoline reviews. A trampoline is a big family purchase. So choosing the right one for you and your family is of utmost importance. There are many factors to consider when purchasing a trampoline – including safety, durability, portability, and price. Below, we’ve reviewed what we consider the eight best trampolines of 2019. If all you’re looking for is the best trampoline on the market rather than looking for a specific category, then read on! 4.6 250lbs 9 X 15' Rect. Skywalker is perhaps the most respected trampoline company currently operating, and the Jump N’ Dunk is one of their best offerings for kids and teenagers. At a diameter of 15 feet it’s big even by trampoline standards, and with a 200 pound weight capacity you might be able to use it with multiple (young) children at once! 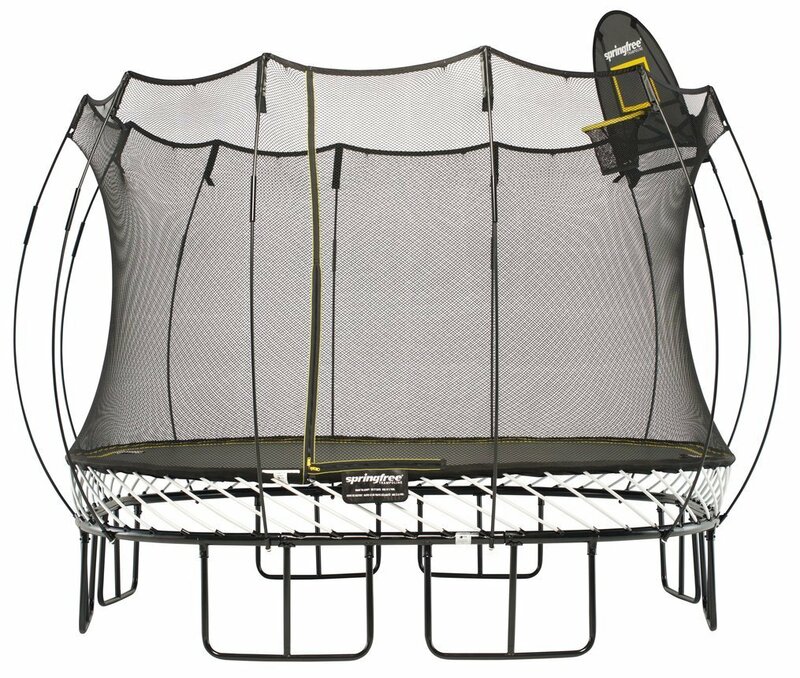 This Skywalker trampoline is made of only the best materials and includes an enclosure net that will prevent your children from falling off the trampoline and hurting themselves on the ground below. A reinforced T-bracket frame made of 16 gauge powder coated steel also makes it a little more stable than similarly-sized trampolines. The main gimmick from which the Jump N’ Dunk takes its name is the small basketball hoop attached to the netting (which comes with an included basketball.) The game is a lot of fun and gives your kids an incentive to use the trampoline besides just jumping. This is another trampoline that comes with a basketball hoop, although there’s plenty that sets the Merax Round apart from the competition. 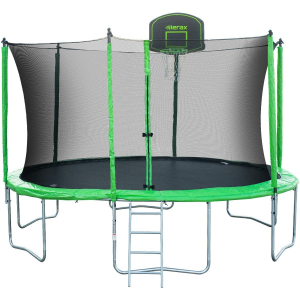 For one thing, it’s a little smaller than the Skywalker Jump N’ Dunk with a 14 foot diameter – plenty of room for jumping, but a little easier to fit into most backyards. There’s also a 12-foot variant that comes with the same features as the 14-foot version but is even more portable. One of the best things about this trampoline is its durability. Every piece is made of heavy-duty galvanized steel wrapped in weatherproofed padding that can be left out in the sun without fear. Having six legs makes it more stable in wind than the lightweight Jump N’ Dunk and the safety enclosure is extremely tear-resistant. The 330 pound weight limit is also a nice touch. That’s much higher than the weight limit on most trampolines, and it means that adults and children can both use this great item for working out, having fun, and shooting a few hoops. 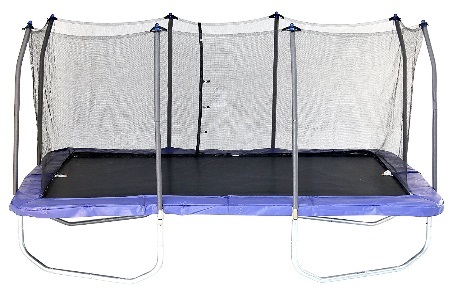 If you’re looking for a great toddler trampoline, this is easily one of the best for sale. 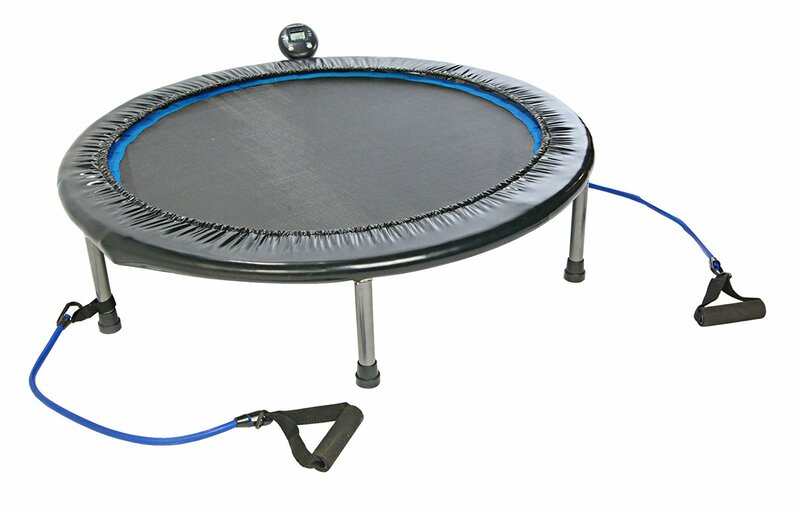 This 3-foot-diameter trampoline is very affordably priced at less than $50 USD (at time of writing) and has a 55-pound weight limit. What makes this single-person trampoline great for toddlers? First and foremost: safety. Every piece is wrapped in thick tear-resistant plastic that makes it impossible for even the most inquisitive child to get their fingers cut in the springs. The safety bar is also wrapped in rubber, which makes it easy to grip and should prevent your child from slipping and hitting their head on the bar. 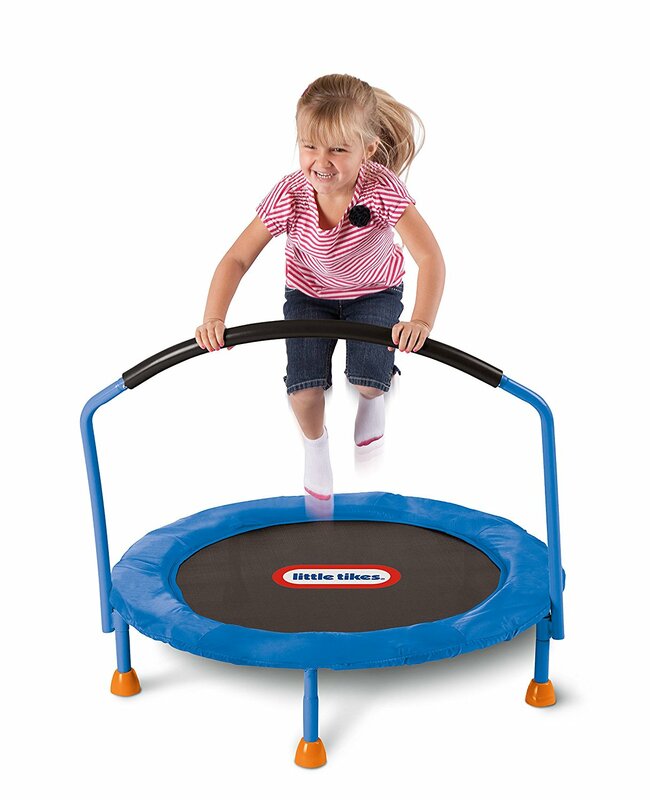 Even the feet have thick plastic tapered coverings, which have the added benefit of making the trampoline very stable even when the most active tike is jumping on it. This trampoline is a great way for kids to burn off some energy in a way that’s safe, fun, and affordable. Plus, there’s almost no assembly required because the trampoline comes pre-built and unfolds. This rectangular trampoline – which once again comes from the well-respected Skywalker company – is one of the biggest and bounciest around. The 15 foot by 9 foot jumping pad provides a ton of room and is supported by a huge number of springs that will give you bigger and better bounces. The safety net is made of UV-protected polyethylene and the spring pad itself is fade-resistant, making this outdoor trampoline a lot more weatherproof than some of the more recent Skywalker trampolines. The weight limit on this trampoline is a respectable 250 pounds, and it’s great for anyone who’s interested in the gymnastic side of trampolines or who just wants to get into shape in a really fun way. Honestly, what else is there to say? 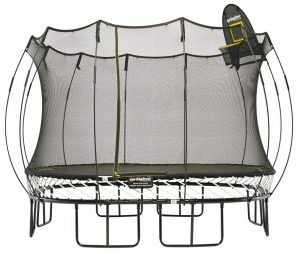 This is probably the gold standard for Rectangle Trampoline and will remain so for the forseeable future. If you want one of the biggest and best trampolines around, look no further than this big beauty! The amount of bounce per jump may cause safety concerns. We do not recommend this trampoline for children. Springfree is a brand known for a very particular design. Most trampolines use springs to provide bounce – a design that’s lasted for years, but which can also be dangerous, especially for kids who sometimes can’t resist putting their fingers in the springs and hurting themselves. Springs can also get tangled up in each other, and having a lot of springs provides a lot of weak points because if even one spring breaks the trampoline becomes useless. That’s why Springfree trampolines use flexible rods instead of springs. These high-tech trampolines (of which the 11 foot model is the newest and most popular) provide a much bigger jumping area and are much safer than conventional trampolines. This one also has 24 legs for additional stability and a built-in basketball hoop in case you want to shoot some hoops while you jump. There’s a lot of advantages to the Flexrhoop technology, but a couple of downsides too. 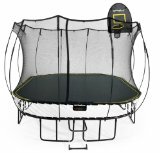 The first is the price – most trampolines on this list cap out at 500-600 dollars or so, but this one costs a mighty $2,245 even. Some people also find them annoying to set up because of all the extra parts. But if you want to see the latest and greatest thing in trampoline innovation, look no further than this great Springfree model. 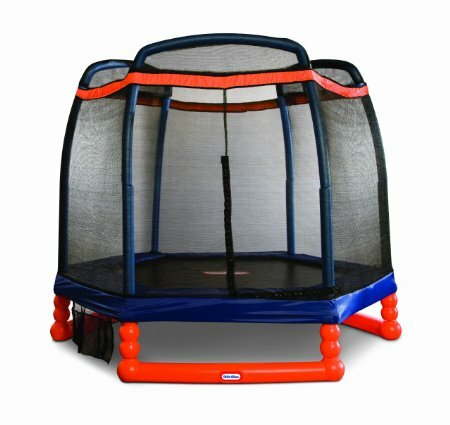 The Little Tikes 7ft trampoline has a great enclosure to ensure your little ones do not fall off. That is the main reason we prefer this trampoline over mini trampolines with a bar. Another great safety feature is the foam covering on all of the springs and the frame, which is itself made of blow-molded plastic and steel for stability. This trampoline is recommended for children from ages 3 to 10 and has a maximum weight limit of 100 pounds. So if you have little ones at home and you’re looking for a perfect kids’ trampoline, you should get years of usage out of this simple but safe model. 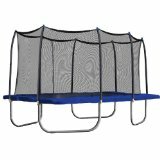 Because of the size, this trampoline is recommended primarily for outdoor use, unlike the 3 foot Little Tikes model we covered earlier. Still, trust us – your kids will not be disappointed if you buy this great trampoline for them! Upper Bounce is becoming a real powerhouse in the trampoline space, and the Upper Bounce Spacious rectangle trampoline is one of their best and most popular models. It’s very easy to assemble and will require no additional tools or hardware besides what comes in the box. The safety net is held up with Top Flex Pole Enclosures that will not sag over time, so even though this trampoline may cost a little more up front, you’ll get many years of use out of it. Being a rectangular trampoline, the Spacious will also give you more height with each jump and is especially good if you’re looking for a durable fitness trampoline to add some “spring” (pun intended) to your workout. But the best thing about this trampoline is the 500 pound weight limit. In most cases, that’s enough for two adults or one adult and a couple of children to all jump at once. 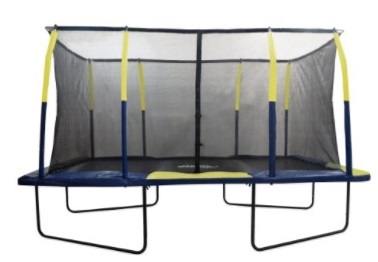 So if you want a heavy duty trampoline, consider looking into this Upper Bounce rectangular model! This single-person Rebounder Trampoline is one of our favorite recommendations for anyone looking for an indoor trampoline. It’s highly fitness-focused (you can even find a version with a FitBit-esque fitness tracker built right in) and the jumping surface doesn’t wear out even under constant pressure. The Stamina Folding Trampoline, as the name implies, is also incredibly portable.It can be folded in only a couple of minutes for more convenient storage or transport and only has a three-foot diameter even when unfolded. Despite this, the trampoline can easily handle a 250 pound weight limit. This is every parent’s top concern when purchasing a trampoline. Although most of those purchasing the trampoline grew up in an era of standard spring trampolines, six people jumping at once, and surely no enclosure, trampoline safety has come a long way. Now available are Springfree trampolines, net enclosures and a variety of pads to protect those trampolines that do contain springs. The safest trampoline will definitely be one which includes an enclosure to prevent children from accidentally falling off. Read our report on the safest trampoline before making your purchasing decision. A relatively new concept in the world of trampolines is a Springfree trampoline. Anyone who has slipped through the springs of a trampoline should consider a Springfree. I know as a child (and maybe guilty as an adult as well), I have gone up for a jump and came back plunging through the springs. Not so comfortable, especially for the men and boys. Now available are Springfree trampolines which are radical new inventions to the trampoline world. Although a springless trampoline is in no way a complete solution to trampoline safety, it sure does eliminate one dangerous aspect of falling through the springs. Springfree trampolines are more expensive, but then again the springs and mats do not need to be replaced as on a conventional trampoline, so this is a consideration to keep in mind. Is bigger always better? Not necessarily. A smaller trampoline, excluding kids trampolines and exercise trampolines, provides more of a bounce. On the other hand, a Larger Trampoline provides significantly more surface area for jumping. This is critical if you’re like us and can’t keep the adults off the trampoline. In that case, you should consider an adult trampoline. Although not advised by us, nor the manufacturers, those that do decide to jump with multiple participants at once or partake in cool trampoline tricks, this is indeed a consideration. You will also need to consider where you will place your trampoline. Make sure you have more than enough room in your backyard if that is where it may be located to accommodate your new trampoline. If you are interested in a water trampoline, you will want to consider how many jumpers/loungers you’d like to accommodate. In which case, you should also understand the weight limits of a trampoline. One last consideration is to make sure the trampoline will be free from overhead hazards. All too often, trampolines are placed underneath trees/branches which can pose a safety issue in addition to a leaf collection area in the fall. Take a look at our comprehensive Trampoline Size Guide here for more details on how to choose the right size trampoline. Although trampoline shape is more of a personal preference, this is another consideration to take into account. Available shapes range from round, oval, octagonal, rectangular and square. Round trampolines are normally for home use and the most common shape. These trampolines are bouncy near their center and normally steer jumpers to remain near the center when jumping. Round trampolines tend to be cheaper and lighter than other shapes. Oval and octagonal trampolines are basically hybrids. 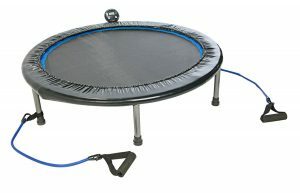 They are bigger and offer more jumping area compared to round trampolines. They also tend to be more expensive than round trampolines. You will not find many options for these particular shapes but there are a few. 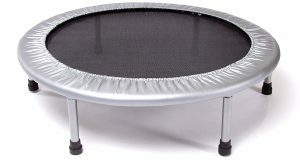 Historically, rectangular trampolines have been used for gymnastics/competition because they offer the evenest bounce over their entire surface. They tend to provide the best bounce heights and a large jumping area. Due to their size, they tend to be heavier and more expensive. Square trampolines are basically smaller versions of rectangular trampolines. They tend to provide a firmer bounce which means less overall jumping height.will provide more lift and a firmer bounce. You will find that many kids trampolines are square, as are many adult exercise trampolines. Springfree has even recently put out an 11′ & 13′ square model. Some trampolines accessories are a necessity and others just add to the fun of owning a trampoline. Trampoline ladders are a necessity and most of the top brands have their own version. Some trampolines come with a ladder and others do not so keep that in mind when considering the overall price. They help kids go onto and off of trampolines safely. We prefer the ladders with plastic steps because metal can get quite hot during the summer months. There are also rope ladders you can buy for your trampoline. Anchor kits are a necessity in our opinion. Trampolines can be a big investment so you might as well spend the extra money to secure that investment in place. During storms and high wind situations, trampolines can easily be blown away if they are not properly secured to the ground. Also, anchor kids can be a theft deterrent. You will have to buy your anchor kit separately. Spring pulling tools are a must-have. It makes pulling the springs into place a lot easier during installation. Some trampolines will come with one and other will not but these are pretty cheap items. Please be careful because some of the cheaper spring tools have been known to break. Trampoline covers are great investments. They will protect your jumping surface from the sun, dirt, rain, bird droppings and more. Shoe holders are a must have but a nice thing to have. It keeps all of your kids’ shoes store neatly under the trampoline. Trampoline tents are a fun way for your kids to hang out on the trampoline. Some people even allow their kids to sleep in the tent at night. It is high off the ground so your kids do not have to worry about getting wet from the dew on the ground. Trampoline basketball hoops are another way to keep your kids interested in their trampoline. 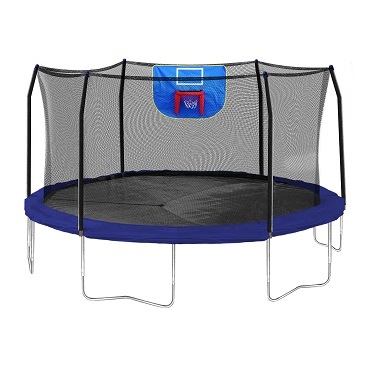 Some trampolines like the Skywalker Jump and Dunk come with the basketball and hoop but there are also aftermarket ones you can purchase. Bounce boards are another item that can be added fun for kids. They are especially great for kids who like to skateboard or ski board. They allow them to try tricks and the soft board.